So you've heard of a partridge in a pear tree. 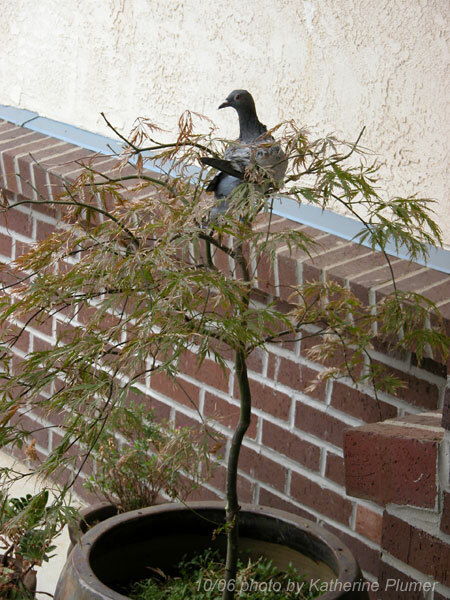 Well today I was rather surprised to come home and find a pigeon in a Japanese maple (a very tiny maple, I might add!). Seems an odd resting place. I went out to have a chat with it (pigeons are NOT encouraged to hang around here....) and it flew away, so at least it wasn't sick. Weird. In other news I hung ten art pieces at a real estate/home loan office in downtown Sacramento. It's in this super cute old Victorian house, and the art looks REALLY nice there. There are two other artists showing also-- a photographer and a painter. Everyone's styles are extremely different, so that's fun. The day was a blur. Thanks, I'm sure they will be fine!